Ballistic facemasks aren't new. We've seen them in movies, comic books, video games like Army of Two. And we've seen them in real life, where they are utterly intimidating. Recently, website site DDN Japan and Tumblr site You're Not Bulletproof pointed to these photos of Taiwanese Special Forces troops. The pics are from a military parade a few years back and show troops decked out in ballistic facemasks. According to You're Not Bulletproof, the masks are designed to protect wearers from close-range headshots and are apparently able to withstand a .44 Magnum. Keep in mind, even with the facemask, getting shot could break a nose, fracture a cheekbone, or knock the wearer unconscious. Then, as Slate points out, there's the limited visibility, the breathing difficulties, and the added weight. 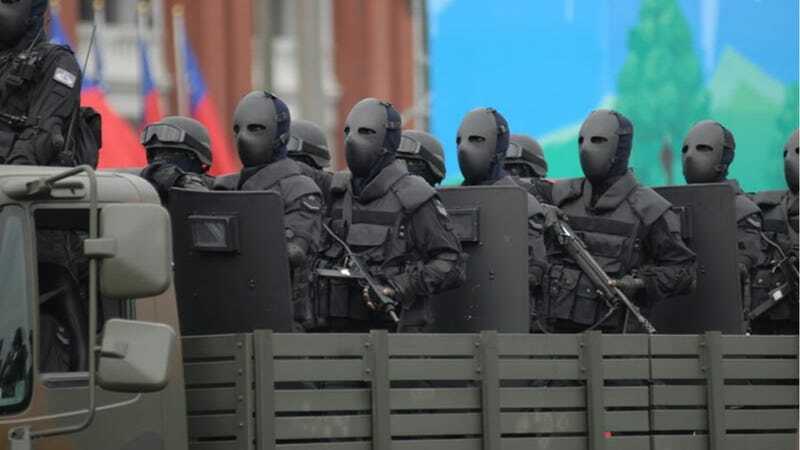 These masks sure are frightening, though, and make the wearers look like baddies.